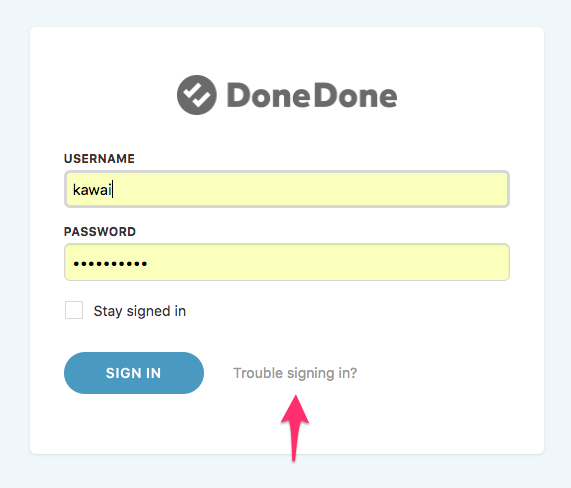 You can sign in to DoneDone either through GetDoneDone.com or through your account URL (e.g. yourcompany.mydonedone.com). Note: Usernames and passwords are both case-sensitive. If you've forgotten either your username or password, you can request a password reset email either through GetDoneDone.com or through your account URL (e.g. yourcompany.mydonedone.com). If you're going to your account URL (e.g. yourcompany.mydonedone.com), simply click the Trouble signing in? link on the sign in screen. Then, enter your profile email address.